Imagine yourself describing colours to a person born without sight. Their blindness brings them no frame of reference - they can’t just picture a colour based on the name alone. When you say red to a person with vision, they picture the colour red. Maybe they picture a fire truck, a rose or perhaps mom's tomato soup. You can’t say just red to a blind person and have them experience red. Meet TASTE MAG 2019. My name is Patricia Jones and I am the Publisher of TASTE MAG. I’m stationed downtown in the Kiss Media Group hub, right in the heart of Victoria with hundreds of dining experiences only footsteps away. My mission is to turn eaters into diners, and diners into foodies. My weapon? Words. The words used in TASTE MAG online and our beloved print field guide will be carefully chosen to do just that - Every word and phrase we write will be palatable as if it’s jumping off the page and becoming a clear vision in the mind. We will describe the dining experiences in Victoria as if the readers have never seen a restaurant before. Every word will be chosen as carefully as our chefs craft their dishes. Readers will feel as if they’ve already been seated, they’ll smell the aromas from the kitchen and know the ambiance intimately. Words can be a tricky dish to serve. They’re overexposed and absolutely everywhere. Our TASTE MAG mission is to create clear images in the minds of our readers to inspire them to get out and taste all the dining experiences this city has to offer. We're starting things off this winter by updating all the menus on our comprehensive menu blog. Did you know that there is over 150 full menus right here at your fingertips? Over the next 30 days, I'll be in person in all the city's restaurants updating menus, and keeping the process live on Instagram and our other social feeds. What's fresh in the city? I'm going to put on my dining Sherlock Holmes hat and find out. There's lots of new spots, some old with fresh coats of paint, that we're dying to crack open and taste. So get out there and explore with me. 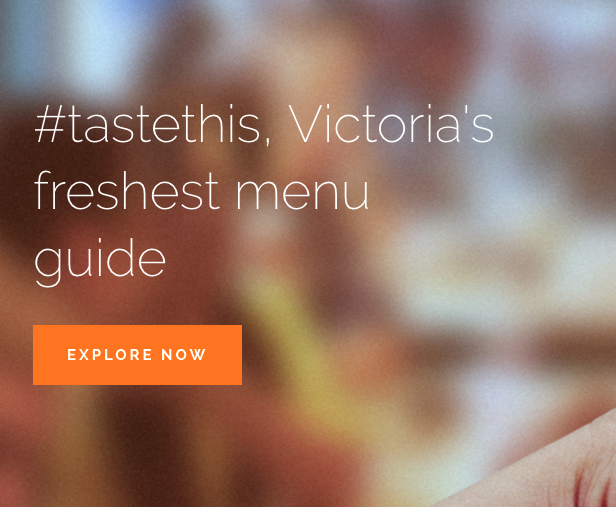 Updated fresh for the start of every month, our menu blog is the most comprehensive guide in Greater Victoria. How can you do that? Well, you can leave your comments behind on the menu blog posts and share your thoughts on your favourite menu items. You can snap pics of interesting morsels and send 'em on over to me. You'll even have a chance to cast your vote for your favs and be invited to our Pinnacle TASTE Awards 2020 ceremony early in next year. It's our city, and there is plenty of room at the table for you.